London, The Arab Weekly – One hand rests on a wooden cane. Dark eyes stare mournfully into the middle distance. The image of Sheikh Saeed Adam Omar, one of the last of the Guardians of the Prophet’s Mosque in Medina, showcases his inherent dignity and humanity. He died not long after the portrait was taken. Not much is known about the Guardians of the Prophet’s Mosque in Medina, holders of the keys to Prophet Mohammad’s burial chamber and the historic mosque’s minbar. The position of Guardian dates to the mid-12th century. Hail­ing from Abyssinia (now northern Ethiopia), the Guardians have pro­vided services to worshippers at the mosque for centuries. At times, the order numbered more than 100. Now, there are five; they are the last Guardians after Saudi Arabia said it would discon­tinue the office. Saudi artist Adel Quraishi’s exhibition The Guard­ians at London’s Park Gallery, part of the Nour Festival, aims to bring them out of the shadows. The portraits of eight Guardians dominate the small exhibition, with each image allowed room to breathe and showcase the dignity and humanity of the subjects. “That is the intention of all my portraits. One has to do more than simply take a photo. In order to succeed as an artist, I have to ex­tract something from the subject,” Quraishi told The Arab Weekly. “I received no specific instruction as to how I should photograph the Guardians but I set out to dig out the best that I can from them as characters and human beings. The Guardians can still be seen roaming the prayer halls of the Prophet’s Mosque in Medina but it is an increasingly rare sight. For many Muslims, a chance encounter with one of the elderly Guardians is a momentous occasion, remem­bered by children and grandchil­dren. 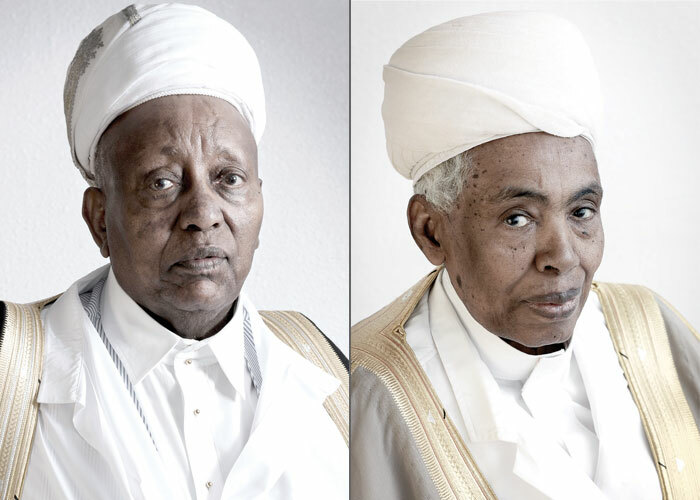 Soon the Guardians will be relegated to the annals of history but they will live on through Qurai­shi’s elegantly shot portraits. One can sense the different char­acters and characteristics on dis­play and Quraishi’s camera man­ages to imbue the portraits with the weight of history. This last group of Guardians will have seen Mecca develop from a small pilgrim town to the metropolis it is today. Next to Sheikh Saeed Adam Omar’s sombre visage, there are seven portraits that highlight the stately visages of the last of the Guardians. Sheikh Ahmed Ali Yaseen peers into the frame with a playful ex­pression on his face, appearing to be concealing a secret and a smile. Sheikh Abdo Ali Shaikh is impas­sive, staring off into the distance and refusing to meet the camera’s lens with his eyes. He appears deep in contempla­tion. Sheikh Ahmed Masibo Saleh, dressed in pure white, looks frankly and sedately out from his portrait. They are the last of the Guard­ians — there will be no others after them. Quraishi acknowledges the his­torical significance of his portraits. “Photographing the Guardians was not just an artistic practice but a historical documentation also. Three of the Guardians have passed away since the photographs were taken in 2013 and others are all quite elderly. That makes these portraits quite unique and made me realise that I had to capture them correctly to do them justice,” he said. The exhibition has had a good re­sponse, with Muslims from across the United Kingdom journeying to London to attend. It has also attracted the attention of many who had never heard of the Guardians. “Adel Quraishi’s exhibition The Guardians represents the Riyadh-based artist’s first solo exhibition in London,” Park Gallery Manager Joe Start said. “Having been pho­tographing passionately for the last two decades, it was not until 2014 that he began to exhibit his work, represented by the Park Gallery. He added: “The Guardians is per­haps Quraishi’s most ambitious project to date — a responsibility to convey this 800-year-old tradi­tion for the first time and do the individual sitters justice, adding more pressure to the task — but the resulting portraits are captivating.